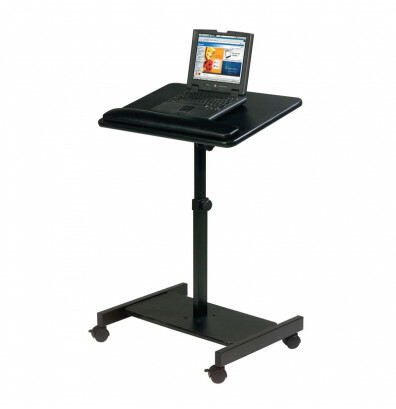 Balt Scamp 43062 mobile speaker stand is a versatile presentation tool that can serve as a lectern or laptop/keyboard stand. Height adjustable for optimum individual use. 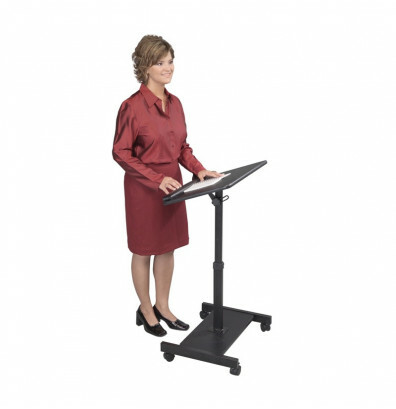 Dimensions: 24" W x 18" D x 27" to 43" H.
Balt Scamp 43062 mobile speaker stand provides a useful presentation top for lectern, laptop, or keyboard use. Height adjustable from 27" to 43" high to accommodate different users. 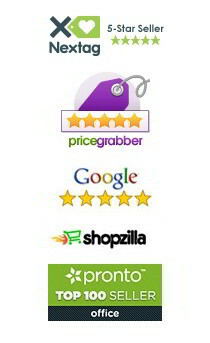 The top platform has a tilt range of 30 to -25 degrees for the right reading or typing angle. Outfitted with a padded wrist rest for added support. The durable frame rolls smoothly between sites on four 2" swivel casters; 2 wheels lock for reliable static positioning.